Anton Roolaart returns after 7 year hiatus with stunning sophomore CD. It’s a wonderful melodic, symphonic rock album that contains lush orchestration and guitar performances plus a special guest vocal appearance by Annie Haslam on the title track “The Plight of Lady Oona”. Anton Roolaart is a Dutch-American solo artist and composer. Early in his childhood he was exposed to classical music from his father, who was a serious music enthusiast. He also grew up listening to classic rock and “progressive rock” bands since the early 70′s. When he was young, his older brother (shown in this picture) was playing in a rock band and Anton saw what he wanted to do. During this time, he was particularly interested in the music from the likes of Cat Stevens, Neil Young, Pink Floyd, Yes, and Bowie just to name a few. At the age of 13 he started taking classical guitar lessons after his mother bought him his first classical guitar and he studied classical guitar for 2 years. Later in his teens, Anton was drawn more and more to playing guitar with friends and he started playing 12-string and electric guitars. He wrote his first song (Shipwreck) when he was 18 when he started to compose his first tunes and play in coffee houses in Charlotte, NC. During this time he was traveling a lot in Europe. After, high school he decided to study “sound engineering” and finished a program at the nearby college in Sound Recording Engineering, before moving to Europe for a year. After spending some time living and traveling in Spain and Holland, Anton returned to the US to finish his studies in Electrical Engineering. Anton soon started to learn about midi and keyboards. He enjoyed the technical aspects of producing music. Continuing to write and play his music in coffee shops, Anton started singing more and more as well, developing his style. He started gathering not only guitars but also keyboards as he enjoyed to play with many layers and sounds. Soon Anton was building his own small home studio. One of his first inspirations for his more ambient music came from Jon Anderson’s solo effort “Olias of Sunhillow”. Anton got married and raised a family while working on his music. Continuing to improve his recording skills as well as his musical skills. In order to fulfill his dream, Anton decided to take some Drum and Piano lessons for a little while. Anton says he was very much influenced buy the likes of Steve Howe (Yes) and David Gilmore (Pink Floyd). 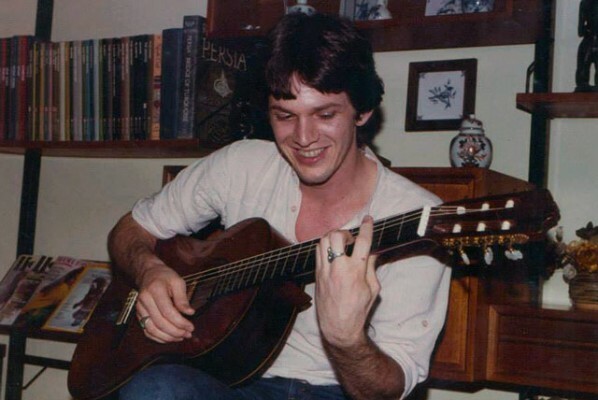 After University, Anton moved to New Jersey and got married and raised a family, but all the while focusing on his song-writing, home recording studio, and playing guitar. He also played in a few bands that performed covers and some original tunes. He was more interested in collaborating on original music with others. He played often in Coffee shops in the New Jersey area. After many years of building his skills, Anton decided to make a serious recording and, at the same time and by a series of unpredictable events, he founded a progressive rock radio station (ProgRockRadio.com), which introduced him to many bands that he had not heard before. It also provided Anton with some useful connections in the prog community and feed his thirst for the genre. Back in 2005, Anton was introduced to Rave Tesar (Renaissance/Annie Haslam Band) by a mutual friend and they became good friends. Anton soon decided to work with Rave on his first album – Dreamer, which did pretty well for a debut album. While Anton produced his own music, Rave played an integral part in helping Anton in this effort and performed various keyboard parts that Anton could not perform on his own. Anton has been working several years on this second CD – The Plight of Lady Oona and has included some other musicians as well, including Kendal Scott (keys), Michael Frasch (Drums), and his friend from Holland – Pieter van Hoorn (Drums). He also introduced his first guest vocalist – Annie Haslam (Renaissance) on the title track.